February 28th marks the two-month anniversary of Lucia Vega Jimenez’s attempted suicide while in immigration enforcement custody awaiting deportation. She died 8 days later. February also marks the five-month anniversary of the historic migrant strike in Lindsay ON against endless detentions, maximum security incarceration and a broken detention review system. Get on the bus! Confirm your seat: http://bit.ly/1kFzQys. If you are coming from Guelph please contact fuerza.puwersa@gmail.com for a ride. The Canadian Border Services Agency (CBSA) is shrouded in secrecy and for too long they have operated with impunity. 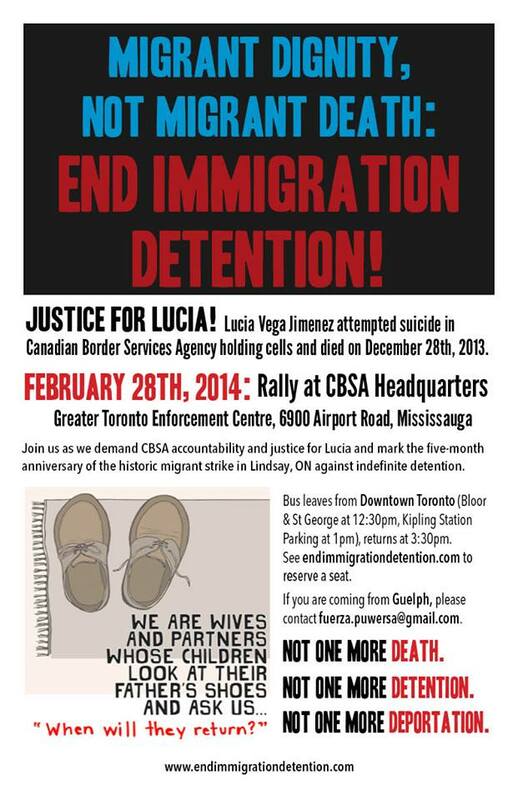 On February 28th we will be at the Greater Toronto Enforcement Center, the largest immigration enforcement site in Canada responsible for immigration detention and over 40 deportations a day We will stand outside those doors and hold the CBSA accountable for the death of Lucia Vega Jimenez and everyone else who has died or suffered at the hands of border enforcement. MIGRANT STRIKE: On September 17th nearly 200 migrant detainees in the Central East Correctional Centre, Lindsay ON began protest actions which captured widespread attention. Detainees have gone on hunger strike (some of them for 65 days), refused to enter their cells, boycotted their detention reviews, and organized other political actions. In retaliation, immigration enforcement deported some key strike organizers, moved others into prisons across Ontario, and locked up hunger strikers in segregation. Yet the strike continues. On December 14th last year, three busloads of families and supporters of immigration detainees drove hours through snow squalls to support these migrants. On Feb 28, we are taking the fight to immigration enforcement’s doorsteps. Since 2004, there have been 8,838-14,362 migrant detentions per year in Canada. Over a third of these, like Lucia and the ones in Lindsay, are held in maximum-security provincial prisons. Canada is one of the only ‘Western’ countries to indefinitely detain people; there is no so-called ‘presumptive period’ on how long a migrant can be jailed pending deportation. This means that some immigration detainees have been unjustly locked away for nearly ten years. Lucia Vega Jimenez’s death is the latest in a series of suicides, deaths and discrimination at the hands of the CBSA and immigration policy. Just recently, Mohamed, Shyroz and Qyzra Walji killed themselves rather than be deported a day after meeting with enforcement officers. Mr De Souza, a Toronto resident for 25 years, passed away on January 18th and his family was denied City of Toronto funding for a subsidized funeral simply because Mr. De Souza was undocumented. The City asked Mr. De Souza’s family to declare the body abandoned. On Feb 10th 2014, Avery Edison, a British comedian, was denied entry at Pearson airport and was then detained in a male prison, potentially vulnerable to sexual assault and attacks due to her status as a transgender woman. The CBSA locks people up then throws away the key. Canada’s immigration policies fracture families and communities and deny many the freedom to move and to live. This requires resistance and response. Join us on February 28th as we crank up the pressure. Bring your friends. Bring your rage.